seawapa.co: It's not about Hamas; it's about the GAS, Stupid! 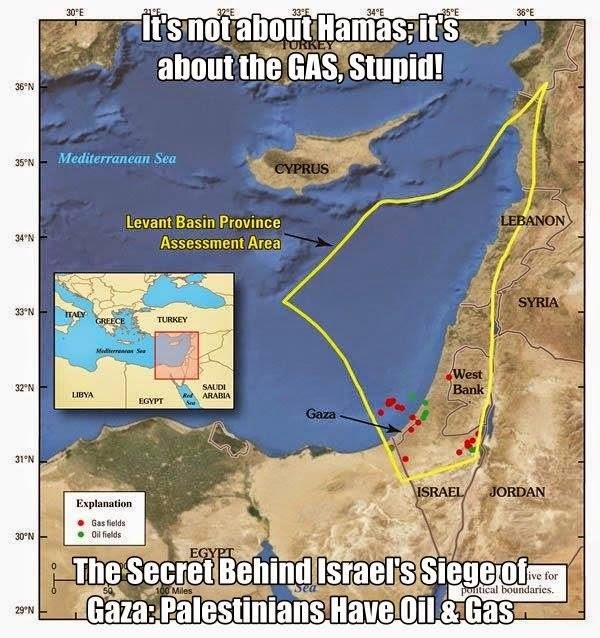 It's not about Hamas; it's about the GAS, Stupid! Guess What? Lots Of Oil, Natural Gas In Gaza! Finding information about Palestine's oil and gas resources is difficult. Even wikipedia doesn't mention it nor do most encyclopedias and other academic resources. The major corporate media has completely ignored and/or has remained blissfully ignorant about Palestinian oil and gas because it goes against the script of how powerful hidden western corporate and government interests want to portray Palestine. Western media, Israel and the US would rather have the world see Palestinians groveling in extreme poverty and/or portrayed as "terrorists" who want to kill everyone. Palestinians, empowered from oil and gas revenues, could live decently. Shed of their impoverished image, the world would see them as the Bright, Shining Human Beings they are. But Bright, Shining Human Beings are harder to disappear than those depicted by governments and the media as untermenschen (nazi German term for "inferior people"). If you want to know more about this important subject, the best places to look are oil and energy websites and publications. Palestinian oil and gas is no secret in the energy field. It's just a secret to everyone else. So why is Israel really attacking Gaza? It's not about self defense and it's obviously not about avenging those three teenagers. Those are just cover stories for the naive. What this is really about is natural gas. It turns out that Gaza has quite a bit of natural gas on its coastline. One of the largest sources in the region. British Gas, which holds a joint exploration agreement for the area estimates that the fields hold at least 1 trillion cubic feet of gas. That gas belongs to the Palestinian people and they should be the ones to benefit from it. Israel disagrees. After the death of Yasser Arafat, under questionable circumstances, Israel has controlled those fields, and British Gas has negotiated with Tel Aviv. With power divided between the Palestinian Authority and Hamas, the Palestinians have been too weak to put up any meaningful ,resistance and Israel would like to keep it that way. The Unity Government between Hamas and the Palestinian Authority threatens Israel's control of those fields, and as such it has to be destroyed. Much is still unexplored, but currently Palestine’s Gaza and the West Bank between them show the greatest discoveries, with anything found in Lebanon and Syria’s territorial waters sure to involve claims from both countries. Russia’s Gazprom, of course, is not keen to lose its stranglehold on the European market. To that end, it’s jumped in on Tamar itself, obtaining exclusive rights from Israel to develop the field’s liquefied natural gas (LNG). Here’s the plan: Russia is hoping to divert Israeli gas exports to Europe by banking on these resources being turned into LNG for Russian export to Asian markets instead. Russia is willing to invest heavily in a $5 billion floating LNG facility to this end. In return it gets exclusive rights to purchase and export Tamar LNG. (Gazprom has signed the deal but it still awaits final approval from Israel). For Israel, this is a windfall. There is an estimated 425 billion cubic meters (16 trillion cubic feet of gas in its Leviathan field, plus the 250 billion cubic meters in the Tamar field, which is now officially pumping. All this gas is worth about $240 billion on the European market, and Tamar gas alone could boost Israel’s GDP by 1% annually. For now, the Tamar gas will result in a decline in the price of electricity for Israelis by way of reducing the production costs for the state utility. In a significant political and economic development, Palestinian President Mahmoud Abbas met Jan. 23 with Russian President Vladimir Putin. The meeting came as a prerequisite to officially sign an investment agreement aiming to develop the Gaza offshore gas field in the Mediterranean Sea. It is only logical to assume that this step will raise the ire of Israel. The latter does not appreciate the role Russia plays in the region, especially since Israel has never come to an agreement with Russia.